Warning: I feel like it's going to be difficult writing this without spoilers, so if it's a little bitsy to read, my apologies. Also, if you haven't read Red Queen yet, there may be a few accidental spoilers in here for that first book. You've been warned. Picking up right where we left off in Red Queen, Mare and Cal are with the Scarlet Guard, running from Prince (now King) Maven and running for their lives. Having escaped from the kingdom and the mass-murder Maven, Mare is now on a mission to search the country for the before-unknown Newbloods; those people who have red blood but special silver abilities, just like her. While she searches with her friends and allies for the Newbloods, Mare continues to train herself and the others in their abilities, but she starts to become something more than what she thought. She's on a deadly path, and while the others try to tell her, she's very stubborn and carries on, fighting for what she believes is right. As Mare and her team find the Newbloods, they are forever on the run from Maven, who is only ever a few steps behind them, and on a few occasions, a few steps ahead. For some unknown reason, it took me about a month to read this. Not because I wasn't enjoying it, but perhaps because it didn't grip me as much as the first book did. It could also be due to the fact that I was busy. But if it was really gripping me and drawing me in, then I would have made more time for it, or I would sacrifice other things just to read it. Don't get me wrong - I loved this book. I've given it a 4 stars. I do feel, however, that it dragged a bit in the beginning, and only really picked up at the end. I think I just got a little bored of Mare and the others running around the country finding Newbloods. It needed to happen, yes, but I just feel like it took a few pages too many to gather them all. 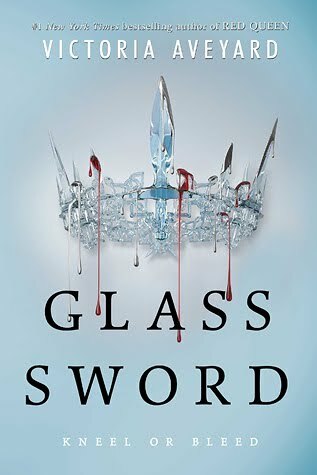 Glass Sword is a great sequel to Red Queen though, and if you've read the first, then do make sure you read the second. Much like the Red Queen, Glass Sword had some great twists and turns in it, an unexpected death (although if you read enough dystopian books then you will see it coming), a falling out, a friendship on the rocks, and one on the mend. Lives are lost, lives are saved, and through it all all I can think of is "but I like Maven...". It seems that a lot of people feel the same. Aveyard has written Maven in such a way that you hate him because he's an evil so-and-so who killed hundreds of people, but you love him and you're secretly rooting for him and Mare to be together. He's your typical bad guy, with a serious Mummy's-Boy complex and he betrayed his friends, his brother, his people. But guys...there's just something about him, and news on the street (aka Good Reads) is that people like him. I tend to agree with them. He's barely in Glass Sword, but when he is you want more of him. Maven is a great character, like Mare, and Aveyard has definitely owned her characters. They're very well written, and I'm looking forward to reading the third book, and also Cruel Crown, the two novellas. If you're a fan of Red Queen, make sure you pick up a copy of Glass Sword. If you've already read it, what did you think?